The Mighty Mekong stretches widely at the southern border between Laos and Cambodia, harboring hundreds (maybe thousands?) of little islands. The entire area is called Si Phan Don, or 4,000 Islands. Whether or not there really are four thousand islands, there are definitely plenty of uninhabited bodies of land and shrubs, ranging from large rocks to small villages. Don Det is the most popular island frequented by backpackers and the only way to get there is by a tipsy boat from the tiny town of Nakasang. The islands surrounding Don Det and the land mass to the east all belong to Laos, whereas the land mass to the west beyond the islands belongs to Cambodia. 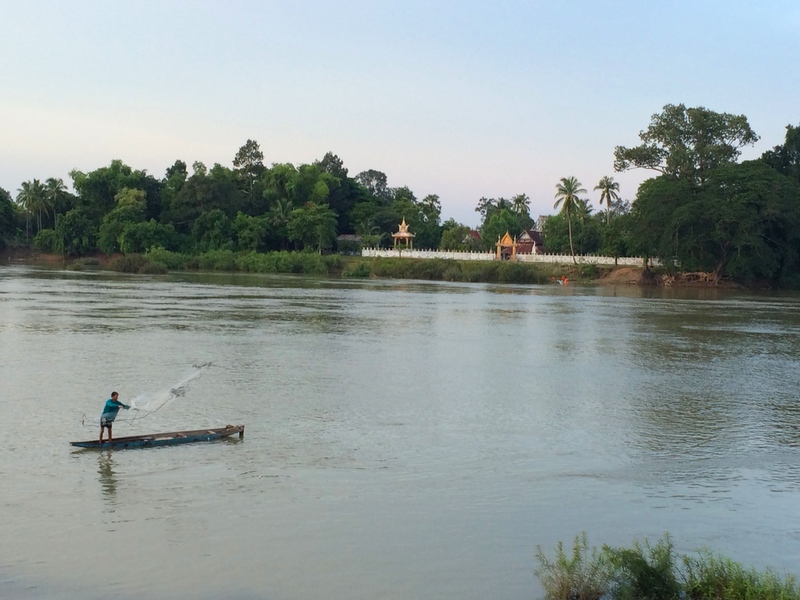 Since the Laos-Cambodian border is conveniently a 30 minute drive away from Nakasang, we decided to spend our final days in Laos on Don Det, soaking in the most popular activity on the island – absolutely nothing. All bungalows on Don Det are more or less the same. Basic accommodation again: bed, mosquito net, fan, and hammocks. Electricity only came to Don Det in recent years, so lights, power outlets, and the electric fan are a luxury, hence I again dub this “luxury camping.” What differentiates the experience is whether the bungalow is on the sunset side or sunrise side. Because we arrived during the low season, everything was pretty vacant. I wanted to spend one night on the sunrise side and another night on the sunset side. 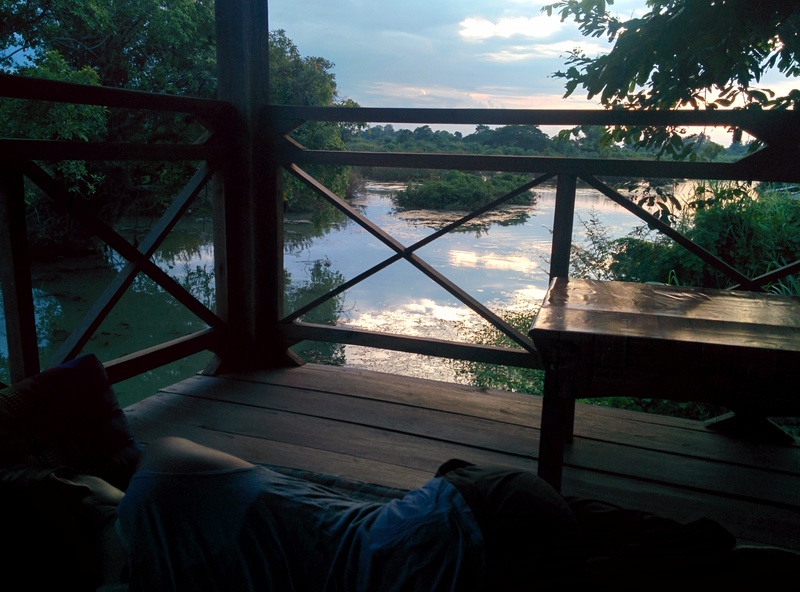 We checked into Mr. Tho’s bungalows on the sunrise side for 40,000 kip ($5 USD) per night. Don Det is miserably hot. Vientiane, Luang Prabang, and Pakse are also hot, but they are larger cities with plenty of air-conditioned restaurants, hotels, and cafes. Because there aren’t any restaurants or bungalows with air conditioning, everyone just slowly melts away into an unproductive puddle of lethargy, typically upon a cushion beneath a fan at a restaurant. 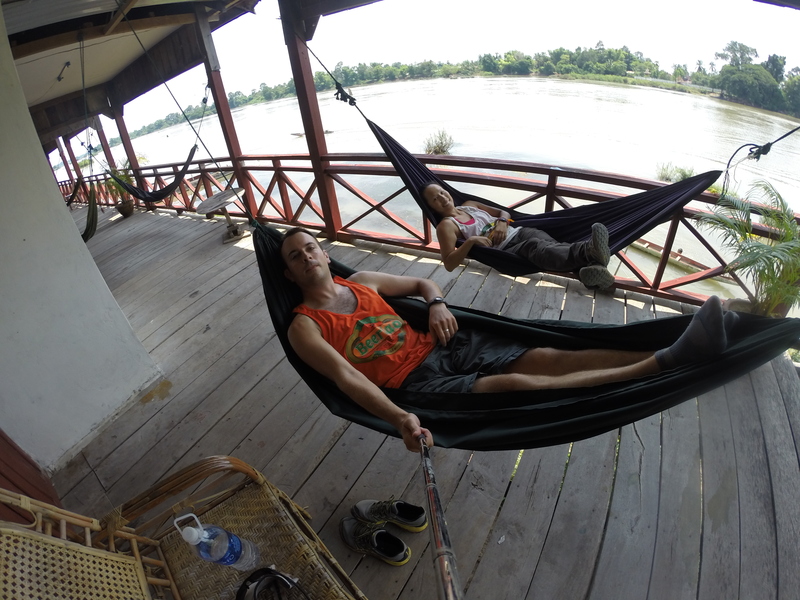 We definitely familiarized ourselves with our hammocks and got used to being sticky and coated in dirt and dust. During our first late afternoon we rode rented bicycles to Don Khon, a slightly larger but less inhabited island connecting to Don Det via bridge. 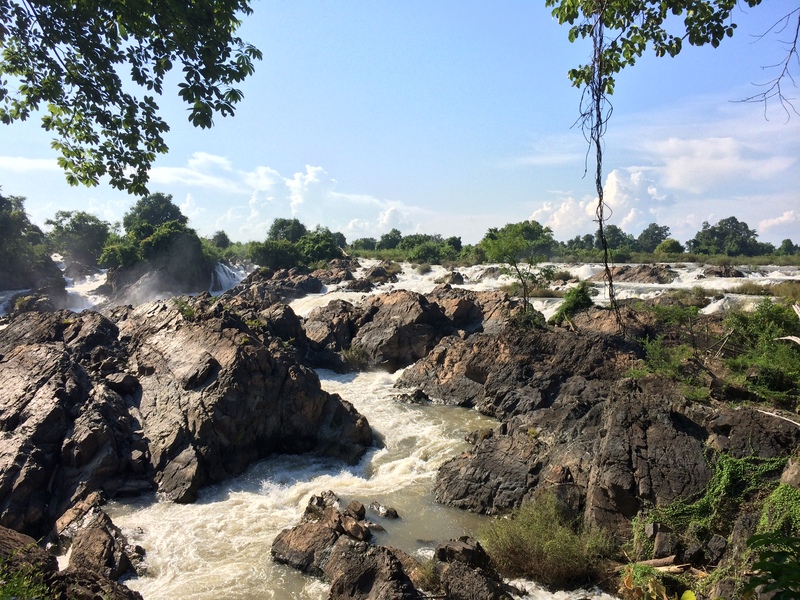 There, we checked out the massive Li Phi waterfall, a powerful surge of water loudly plummeting through rocks along the Mekong. That evening Chris enjoyed reading from his hammock while I observed monks and locals bathe in the river and boaters throw fishing nets into the water. 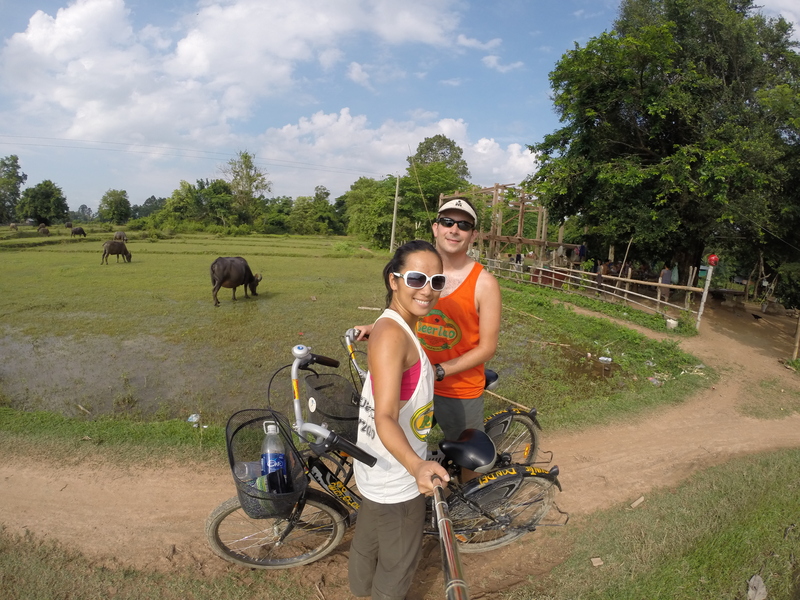 We wanted to ride around the whole island (~7 km) that morning before the heat got the best of us, so we set out at 6:30am with our bicycles to explore the villages, water buffalo, and rice fields. 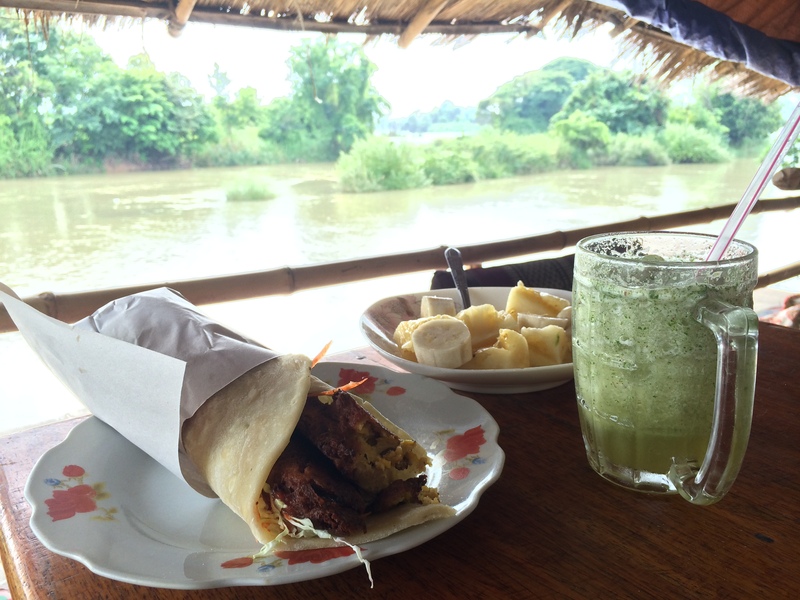 We returned our bikes and feasted on a late breakfast of delicious deep-fried pumpkin falafel, pineapple and banana fruit salad, and lemon mint honey shakes. The rest of the afternoon was spent lounging on the floor beneath the fan at a restaurant. I probably passed out for about an hour during the hottest time of the day. Even the restaurant owners (a young couple and their child) did the same – lounged around sluggishly to pass time. At least we had nice views. 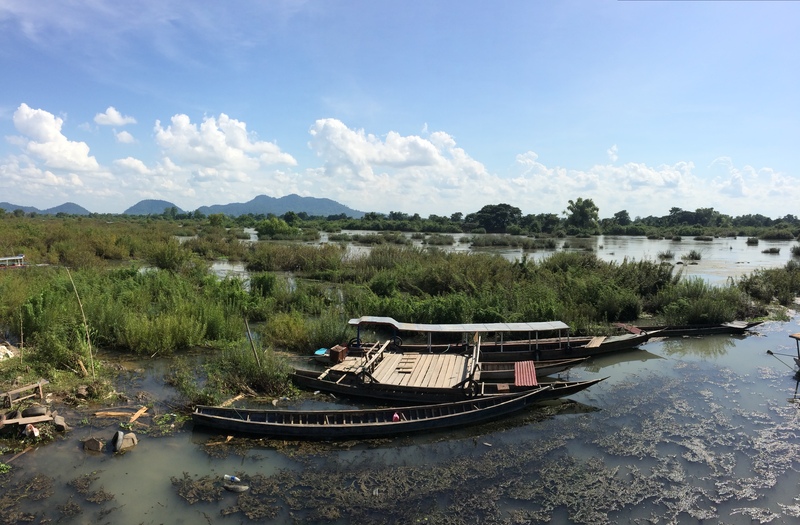 The mountains on the other side is Cambodia! That evening, we took a dip in the Mekong River with the locals to cool off. Then we watched the sun set from our second bungalow at 30,000 kip per night ($3.75 USD). Thanks to the low season, we were the only guests there. Photos really don’t do any justice. 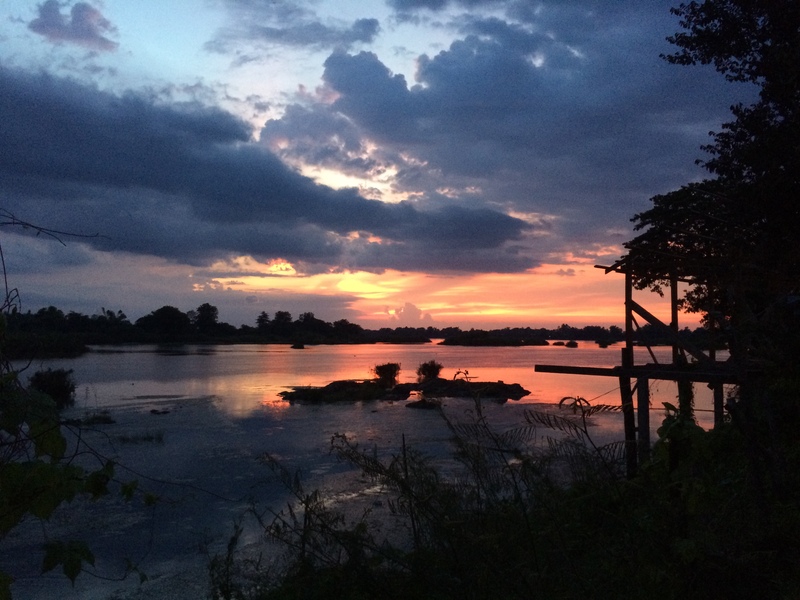 Sunsets on the Mekong from Don Det are said to be the best sunsets in Laos, and I couldn’t agree more. More than often large thunder clouds would creep up from a distance with a radiant pink glow in its fluffy billows. It wasn’t uncommon to hear thunder and see flashing clouds and lightning bolts from afar. 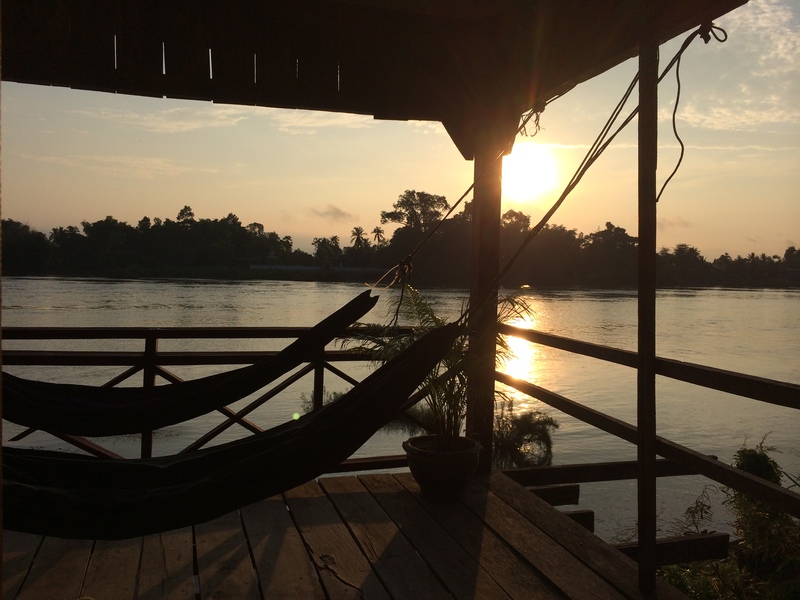 Our final moments in Laos could not have been more serene as we gently swayed in our hammocks that night after the storm rolled through, listening to the soft pitter patter of rain on the tin roofs overhead and the soft squeaks of little geckos from the Mekong below. 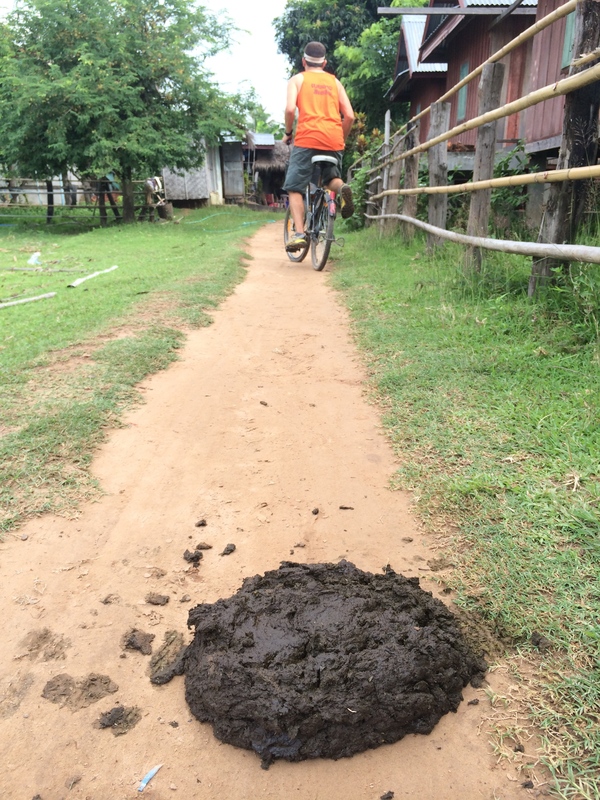 This entry was posted in Laos. Bookmark the permalink.